The Little Mermaid Jr. was created by our TwinkleStars, BuddingStars and RisingStars and featured over 70 young performers ages 4 - 13. Our Junior shows are a way for our students to put their skills-based training into practise. 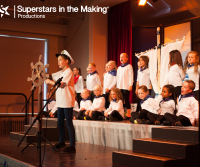 We believe that it is important to allow younger students to shine in their own show, so they experience creating characters and performing principal roles. Directed by Joseph Mees, Musically Directed by Amy Smith and Choreographed by Rebecca Thomas. This was another sell-out performance. Our students train with our teachers weekly to build the latest techniques in acting, voice and dance and learn to build their craft in an inspiring way. Little Mermaid Jr. was an excellent platform for all of our Junior students to shine and grow!